3: Target creature loses -2/-0 until end of turn. Creatures with power less than 1 deal no damage. 3, T Target creature gets -2/-0 until end of turn. 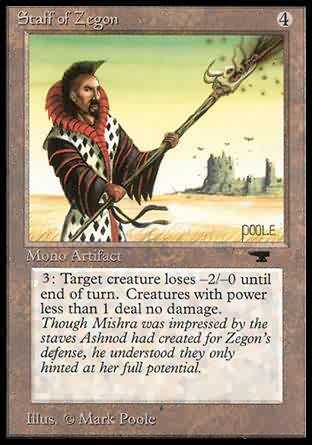 Though Mishra was impressed by the staves Ashnod had created for Zegon's defense, he understood they only hinted at her full potential.